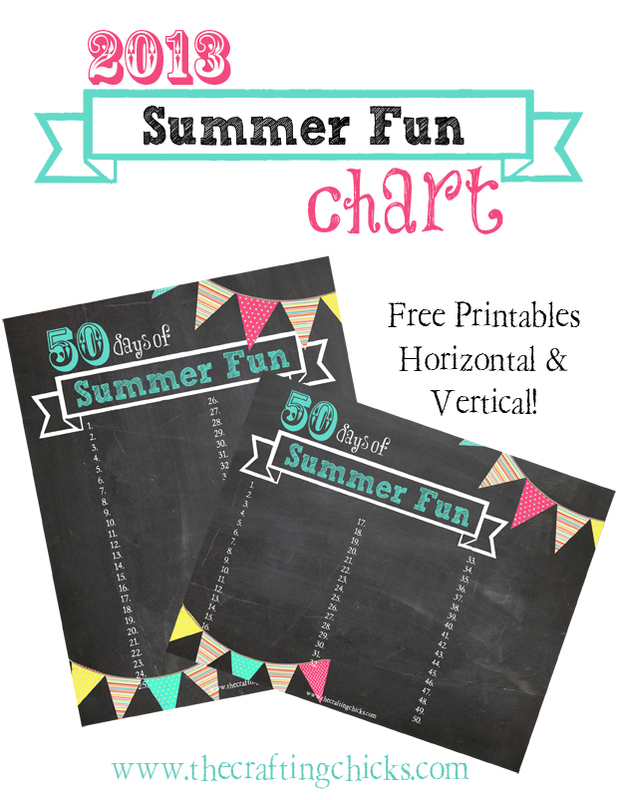 Dun..ta..da..da!…today I’m rolling out the annual SUMMER FUN chart! 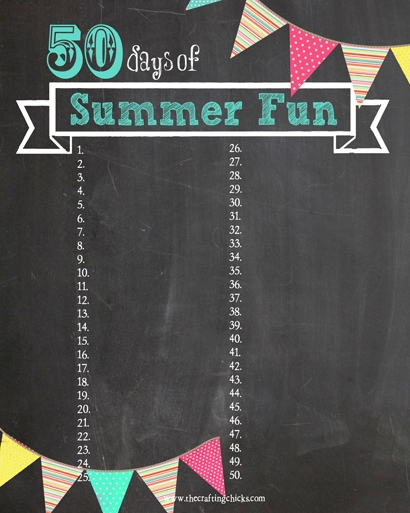 We’ve had several requests for a 2013 summer fun chart and I am happy to share it with you today! You may remember the 2010 Summer Fun Chart, 2011 Summer fun chart, & 2012 Summer fun chart. It’s fresh off the press..aka Photoshop. I haven’t even printed mine yet. I plan to upload it to Costco tomorrow. (size 16×20) My kids look forward to this every year. When we hang it up…I will share some photos as well as a list of our family’s ideas for SUMMER FUN in 2013! Only one month until Summer begins…are you ready? 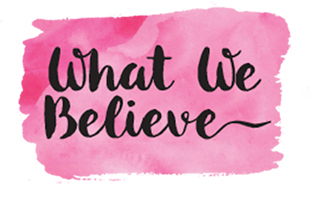 I made both a horizontal and vertical version…take your pick:) Download link below! Love this Jamie! Thanks for sharing! Great idea and so cute!!! Thanks! This is so cute, but I can’t seem to get it to download. It’s opening a txt file? Last year’s was a jpeg, right? Any ideas what I’m doing wrong? Love this, but it’s still wanting to open as a txt file. Thanks for fixing it! I love this & I love the Crafting Chicks!!! Love this but can’t get file to download!!?? I don’t understand- do you write on it as a dry erase type thing if you’re uploading it to costco as a photo? its very very cute. Jen, another option is to use Pic Monkey. Upload your photo then use pic monkey to insert text. send to photo lab. super easy. yes, permanent but still fun. you could scrap book or file it for later then look back after several years to see all the fun things you did. Oh I love this…off to print it now and think up 50 fun ideas. :o) Thank you for sharing! I love this.. wouldlove touse it for FHE next week but I can’t get it to download.. hmm.. i’ll check back later and see if it works. ok.. it was probably just me.. it worked. Thanks so much for sharing!!! This looks great! Can’t wait to print and hang up with my girls! Thank you! This has become a family tradition for us! I look forward to seeing the new one every year! Thank you so much for another GREAT print out. We LOVED putting our list together last year and my son was just talking the other night when we would start making our new Summer list. Thanks, and Happy Mother’s Day! I love the summer fun printables. Thanks for sharing!! Thank you for making this available every summer. My girls look forward to it every year!! Thank you! For some reason I can’t print it, but I will keep on working on it. Hi! Thanks for this great idea! I noticed that one year you designed a journal cover to go along with the chart. Any plans for making one to match this one? Thanks again! Thanks again! This will be our 3rd year and My BOYS look forward to it each year. their friends fight over getting to do our 50 special things so they can help us with the list! Thanks for doing another adorable Summer Fun Chart. My girls LOVED doing it last year and we look forward to it again!! So cute! Love the bunting. Thank you for the download! Love it! My daughter and I made our list this morning and used a cute chalkboard font. This looks GREAT! How did you add the cute chalkboard font and get it to align properly? AHHH!!! I am SOOO happy that you made a 2013 version! I used your 2012 last summer and typed onto it and also printed a 16×20 from Costco. We hung it in our kitchen, framed, and when we did one of the listed, we “crossed” it off with a dry erase marker. All summer long, our guests loved it. Thank you for designing another! Thanks for the template!!! I am sending ours to Costco to print and put up this weekend to kick start summer !! Great idea! Definitely using it next year! Candice you are in luck. Brooke is making up a fall version and I made a spring version. Keep checking back for the fall one! 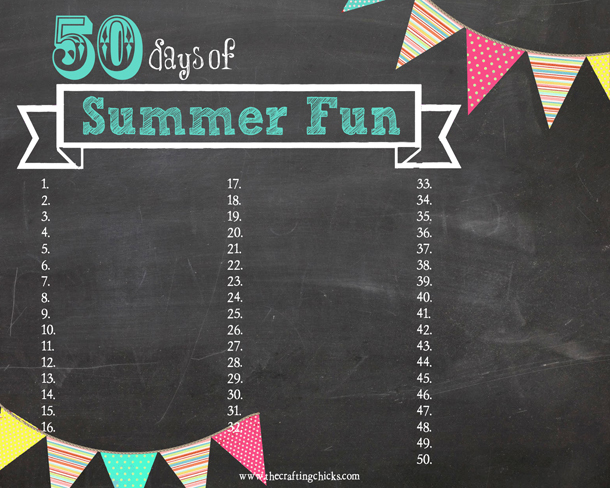 This summer fun list is so cute! I’m having a hard time getting it to download, and I would love to use it this summer. Could you email me the file? I think this one is my favorite so far! We do this every year! Problem is…I can’t get this one to download! Any help? I would love to be able to download this summer chart to do with my kids but it will not let me> could you please send me the link. Thank you so much for sharing but i can’t seem to download..Something is wrong..
My family loves doing this summer to-do list each year! Would you mind activating the link again so I can download it for this summer? Thanks so much!